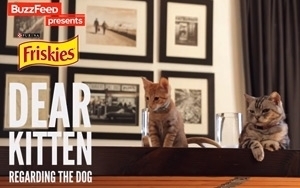 Due in large part to its brilliant content partnership with BuzzFeed, Friskies clearly won social media over the holiday season. From mid-September to mid-December, the Nestlé Purina PetCare brand earned a 62% positive social sentiment ranking among consumers — the highest of any other brand during the period, and nearly twice the CPG-industry positive average of 33%. That’s according to new data from social-media management platform HootSuite, which tracked brand mentions across 26 social platforms and more than 100 million data sources from Twitter to the smallest blog. Good or bad, the social efforts of CPG brands tend to inspire the strongest consumer responses, according to Kate Dunham, a content marketing specialist. “More than any other industry we’ve investigated, CPG brands elicit the most emotion on social due to funny and motivational campaigns and well… smell,” Dunham explains in a new blog post. In the CPG category, Cottonelle and Avon also hit it out of the park — with positive social sentiment rankings of 52% and 50%, during the holiday season. Big losers included Clorox (with a negative social sentiment ranking of 21%); Pine Sol (with a negative ranking of 16%); and Vaseline (with a negative ranking of 11%). Across categories, Dasani and Kool Aid tied for the worst social sentiment ranking (negative 20%) during this holiday season. JP Morgan came in a close second with a negative ranking of 19%, followed by US Airways (negative 18%), SpaghettiOs (negative 17%), and Goldman Sachs (negative 16%). Ironically, social media companies ranked the lowest among their technology peers. Apple, Amazon, and Nintendo won the category with positive social sentiment scores of 26%, 25%, and 24%, respectively, while Facebook and Twitter ranked lowest with respective score of negative 14% and negative 12%. Yahoo also ranked among the lowest technology brands with a negative score of 11%. Handily beating the retail-industry average of 27%, Crate & Barrel scored a 43% positive social sentiment ranking during the period, which was followed by West Elm and Famous Footwear – both of which earned a positive score of 42%. Losers in the retail category included Dollar Tree and Prada (each with negative social sentiment rankings of 12%); and Home Depot (with a negative ranking of 11%). In the media and entertainment category, The New York Times (negative 13%) actually ranked lower than Time Warner Cable (negative 12%). Winners in the category included Travel Channel (positive 33%); The CW (positive 31%); and HGTV (positive 31%).